A five card poker hand, you against the dealer. Fantastic bonus payments if you get lucky. The player antes, and is then dealt a five-card hand; the dealer is also dealt five cards of which only one is exposed. The player now either folds, losing his ante, or bets an additional amount equal to exactly twice the ante. The dealer then reveals his remaining four cards. If the dealer’s hand is not Ace-King or better, the player is paid even money on the ante and nothing (i.e., a push) on the bet. If the dealer’s hand is Ace-King or better it is said to “qualify” (for play against the player). 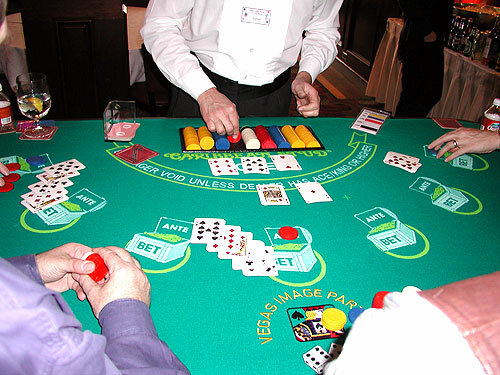 In that case if the dealer’s hand is better than the player’s, the player’s ante and bet are collected by the house. If the dealer’s qualifying hand is worse than the player’s hand, the player is paid even money on the ante.